How cool will it be to have an intelligent ceiling fan that will auto-adjust its speed to your comfort! That’s what we are trying to achieve here. Fans help to reduce room temperature by circulating air. This circulation mixes hot and cool air in the room, and in effect reduces the temperature to an average value of the hot and cool air temperatures. AsÂ you know, we need some input to control the speed of the fan. Here temperature is considered as a measure of comfort, the less the temperature the more the comfort is. Here two thermistors are used to measure the room temperature. This change is reflected on the fan speed by regulating the current to the fan’s motor. 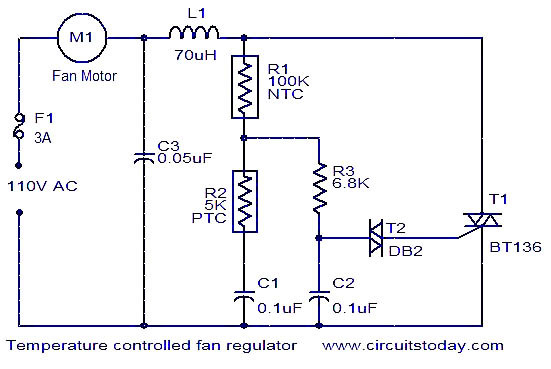 This fan regulator circuit will automatically control the speed of your fan according to the temperature. Two thermistors (R1 and R2) are used to sense the temperature. The circuit works almost like the published here previously. Here the potentiometer is replaced by the thermistors. When the temperature is increasing the resistance of NTC thermistor ( R1) decreases and at the same time the resistance of PTC thermistor (R2) increases. At the same time, the rate of change of the resistance will be different for R1 and R2. This action is similar to a potentiometer used in a conventional Triac based fan regulator. When the resistance is varied the firing angle of the triac changes and so do the speed of the fan. As a result, the speed of the ceiling fan increases with an increase in temperature and vice versa. L1 can be a 70uH inductor. C1 and C2 must be rated at least 200V. C3 must be rated at least 600V. Triac BT136 can safely handle up to 4A load current. The two thermistors must be mounted as close as possible. anyone plz tell me whether using 5k PTC is necessary? can i use NTC instead of 5k PTC? I didn’t find diac db2 is it possible to use other part (an alternative) and what is it ?? we can use db3 instead of db2 . I’m looking for diac db2 but I didn’t find itIs it possible to use an alternative and what is it..
May I know what is the use of C2 capacitor and the inductor? Thanks! could you please give the circuit of ceiling fan voltage regulator that used in our home appliances.our suppy is 230v,50hz.we will be very benifited and thankful to you if yo do this help. Why this type regulator not use in market. what is the use of the l1 and c3? and how much the NTC and PTC cost in india? I think that your circuit is very usefull, but in my area electric supply is 220V-50Hz, so what part I shoud change in the circuit? Pls inform me more data. What modification required for 220V AC fan motor? can anyone help me,what are the modifications that are needed to run a 230v,1.2A single phase motor. Hi Akshay the fan should be rated for 110volt 60Hz. Hi Zunair and kumar this is a simple speed regulator for the fan. The sensing thermisters should be in the air flow path to sense the air temperature. If the room is already quite hot the fan will be always running at high speed. if the temperature of the room reduces then the speed of the fan will reduce. please can some one describe whole of this circuit .em quite new to these things so i cant really get that which bit is doing whatâ€¦can some one help me out please. I have tried this circuit,I observed effect of with 10W lamp. It dims when we put cold object over thermistor and brightens when we remove it.But when i connect it to fan the change in speed effect is not much observable.I measured the resistance of thermistor in morning and at high ambient temp. it varies by 26K ohm to 65 K ohm. But it is found that fan kept on for overnight and due to self heating property of thermistor the fan speed remain high throughout. buenas tardes en cali colombia se consiguen termistores mÃ¡ximo de 1000 ohmios ptc o ntc. pregunto si coloco un resistor variable de 150 kiloohmios en vez de la resistencia de 6.8 K puedo obtener un funciÃ³n similar? cual es su consejo. gracias. IHi Swapni lt is only a line noise filter it can be left as it is. Increase R3 to 22K or more till you get the min imum required speed. hi swapnil PTC is a positive temperature coefficient component. NTC is negative temperature coefficient component. PTC The resistance will increase as the temperature increases. NTC is vice versa. You need not carry out any modification to the fan, in the place of existing regulator you can use the above circuit. for what does PTC and NTC stands for? Is it an embeded system.any software needed?if want 2 b make this project in embeded system what software l b needed??? It’s the same I think, one for each phase. 210 V to 254 V are actually two wire with two phases an inverse wave and are 105 to 127v (if this is mono-phasic, tri-phasic would be otherwise). Maybe you can install two circuits immediately after thermistors, one for each phase. There must be another more simple, but that it occurs quickly. I did try this circuit, but seems there is some problem in it. I double checked if all the parts are working…I don’t get any voltage variation in the output voltage. Can you please halp me with this circuit. what is the rating of the motor?? ?